Mavis the Chi-Poo puppy (Chihuahua / Poodle cross) at 8 weeks old; her mother was a 10-lb. white/spotted Chihuahua and her father was a 4-lb. apricot Poodle. 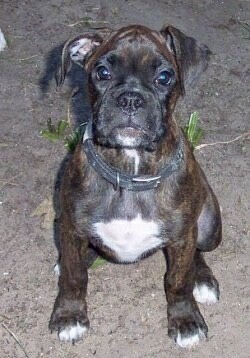 Gypsy Rose the Boxer, all grown up! Maggie the EngAm Bulldog at 3 months old— "Her mother was an English Bulldog and her father was a solid white American Bulldog."